Posted in: Public Outreach. Tagged: pony up, solar eclipse 2017. Dear Astrophiles, we’re officially one week into our Pony Up campaign to raise money to support outreach for the solar eclipse in August this year. Things are going great – we’re 20% of the way to our goal of $5k. Thanks to our many donors and especially to Pam Robbins, Mark & Sharon Johnson, flying m coffeegarage, Scott Watkins, Paul Collins, Cindy Hall, Barbara & Clay Morgan, and several anonymous donors. 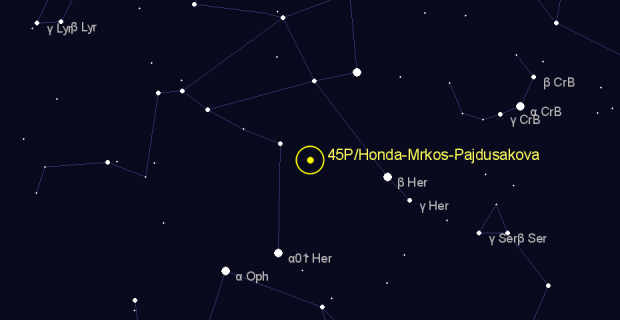 To celebrate our progress so far, I’ve arranged for Comet 45P/Honda-Mrkos-Pajdusakova to pass by the Earth this weekend. You can see Comet 45P in the constellation Hercules high in the early morning, eastern sky. It will look like fuzzy bluish-green ball with a fan-shaped tail. The green color comes from glowing carbon gas.